A Tuesday night visit to watch football on the tv with a pal. It’s been a couple of months since I’ve been in but I was greeted like an old friend by Con the landlord on arrival. We stayed until close and I can report that the Darkstar Hophead is still a perfect drop of ale. As per my other postings this is a cracker of a pub, in fact it’s a proper pub. A lovely pub that reminds me of how pubs used to be. Good selection of ales and ciders, Harveys Best particularly good, and well maintained Guinness which is not a given these days. Friendly and helpful staff and great garden. I have been frequenting along time, demographic is changing as Catford is overrun with developments and regeneration.. Definitely more beards about but that's the way it goes. An excellent little boozer nonetheless. 3 visits in the last 3 and a half weeks on Wednesday nights & Saturday afternoon to watch the football on the tele. Extremely well kept and poured pints of Darkstar’s Hophead always go down a treat and is the only ale I drink when I’m here…it’s that good I don’t need to try anything else. Quality service from the bar staff, good quality ales, good banter all in all the Blythe really is a cracking pub. 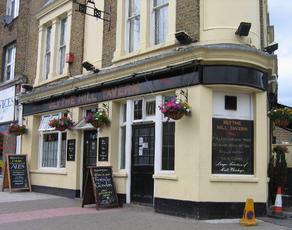 A lovely old pub which is genuinely Irish ,full of sporting memorabilia.Three distinct bars and a pleasant garden. They have quite rightly won many awards for their beer and cider.As well as quality ales a warm welcome is always given.Slightly more big and medium brewery beers on the bar than I would like but I must admit that is a minor quibble.9/10. I'm not sure what I was expecting of the Blythe Hill Tavern when I ventured in there yesterday. But I knew that it was currently rated number 3 in the UK on BITE. But having visited for the first time, I can see why it's rated so highly. I was the first in at 11am yesterday. 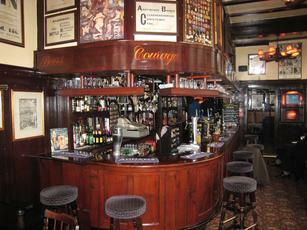 I remained in the small bar at the front, which has a narrow passage between the bars through to the other room/rooms. It almost looks as if you're going behind the bar itself to get through. There were 3 guys working the bar. At least 2 were Irish and all were very friendly and seemingly keen to chat to this first time visitor. It's not often staff take such an interest. So top marks where welcome is concerned. The interior is very cosy. The front bar is decorated with a golf theme and there are plenty of mentions of Ireland. There is a small TV in the corner, where horse racing was showing. If I am to be critical, the ale range could be wider. Yesterday they had Dark Star Hophead, Brockley Red Ale, Courage Best, Sharps Doom Bar & Harveys Sussex Best. But being a cider drinker, I was very happy to see a good and varied selection - Millwhites Rum Cask & Hedgleyer, Lilleys Bee Sting Perry, Sandford Orchards Devon Mist, Turners Russet & Elderflower & Westons Old Rosie. What better way to start a long day of drinking than an 8.5% cider (the Russet). Whilst others came close, the Blythe Hill Tavern gets my vote for my favourite pub of the day in South East London yesterday. Thanks very much to the owner for giving me a copy of CAMRA's London's Best Beer Pubs & Bars book - plenty more ideas for places to visit now. If only this was my local......!